Eclectic Paperie: Do what makes you happy . . .
Tracy here today, I am sooo excited to be sharing . . .
" What makes me HAPPY "
and a smattering of stamps! Apologies in advance for the longish post. Now first I have a confession to make . . . my project was going to be " 3D beach huts " but while rooting around my shed I came across some cardboard packaging and before I knew what I was doing I had grabbed a pallete knife, cracked open the gesso and splattered it all over . . .
Now being an impatient kind of girl . . . 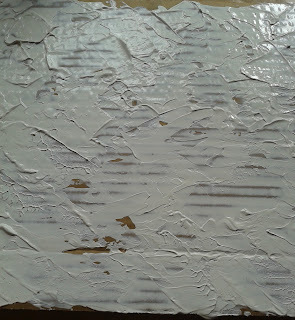 I grabbed my heat tool to speed the drying up, I love how it bubbles up and adds more texture. Did I mention how I love to splodge and splatter? 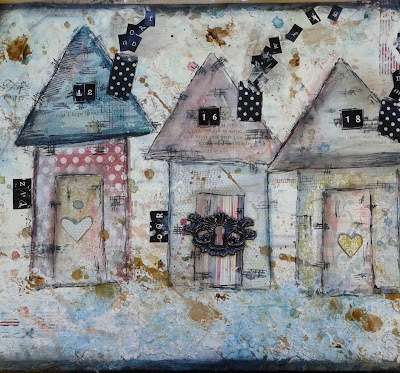 I used a mixture of Tim Holtz Distress Stains, Distress Re-Inkers and Ranger Perfect Pearl Mists . I already started to outline and scribble here with a fine black liner pen but it did get lost along the way with more paint, inks and sprays added! Okay another confession, at this point I had NO IDEA what so ever about what I was going to do next and went into a frenzy of paper cutting, inking, adding more paint, background stamps, stickers, washi tape . . . on and on until I ended up with this. . . little rickety shabby beach houses and seeing as I live in Scotland ... we do need chimneys to keep us warm, lol. The frenzy would be like a You Tube video on fast forward! Still Iwasn`t finished . . . Some sentiments from Donna Downey`s Art and Possibility stamp set, chopped up and fixed in place with Glossy Accents and the the raffia . . .well you can imagine the mess I had created by this time and while moving things around the raffia fell ontop . . . kinda liked it, so spread more out and fixed in place using a hot glue gun. Here are a few close ups . . . can you see I added more of the papers for a door, a heart and to stamp the sentiments on.You can see more of the splattered colours here and lots of scribbles along the way. Washi tape for chimneys and random alpha stickers for the smoke whirling out. 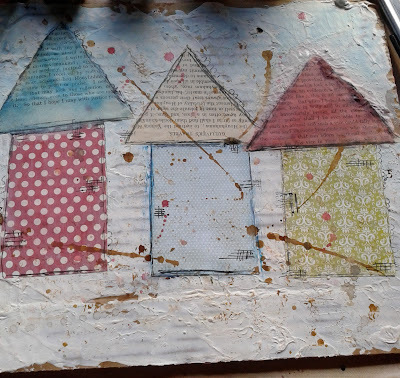 I didn`t like the reddish roof this one had so I added another roof from a book page and blended it in. Permanent Red and the Turquoise from the set. The finishing touch was to take a clear embossing pad, randomly apply, sprinkle with Utee and heat. It hasn`t really shown up in the pictures but it sure does add another texture. So now you know what makes me happy ... inky,painty splattered hands,lol. I hope you aren`t too disapointed at not seeing any 3D Beach huts, but instead my Scottish Shabby ones. Take a little time and do what makes you HAPPY this weekend. Beautiful art work! I so love the wonderful houses, so beautifully done! Not disappointed in the slightest! Your beach huts are stunning, love the way you put the whole piece together... fabulous work. Insanely fabulous, Tracy - the perfect project as far as I'm concerned... I love every single thing about it!! This makes me happy, too. I love the finished piece with all of those wonderful layers of painty inky goodness. The houses are amazing, full of lovely details. The letters coming out of the chimney gave me a huge grin. I also loved hearing about and seeing the process. Your step by step is delightful and inspiring. Thanks, Tracy. Wonderful multi media house canvas with so much greatness! Love it! Wonderful, Tracy! What a great idea to use this as a big 'ol canvas...it's just beautiful and I love those houses...need them!! Another great piece of art! This made me smile this morning. I have a half finished painting on my desk and I was frozen in my creativity.....I shall have to try your style on and see what I can make of it......Your finished peice is Bee - a U tiful! completely adorable! I love that you can just "go for it" when you create. I am far too calculating and am envious of your style! The letter stickers for smoke is a genius idea and the layers and layers of inky bumpy splats are soooo yummy! I so envy your style, Tracy. So loose and free and so lovely to look at. I enjoyed following along as you did a little of this and that. I just love how it turned out! What a brilliant idea to add extra texture with the UTEE to certain parts of the artwork. Very inspired. But Tracy what has happened to beach hut number 14???? and I love your describtion of how it came about, I can so imagine the fun it was making this! So inspired by the way you create! Lol...Tracey...was asked this already and my reply was random..random...lol! Thank you all so much for the lovely comments!! This is absolutely gorgeous. I need a lesson from you! Love the color choices and the metal additions. Very very nice! You make it look so easy! These little "huts" are awesome... this project takes ME to my Happy Place...love what you did ! You created this stunning piece of art onto cardboard?! AMAZING!!!!!! What you have created is SO awesome! I just have no words! Fantastic job!!! Thank you so much ladies,your comments mean a lot! !